I know, I've been such a slacker about blogging lately! I'm finally getting around to posting pictures of our Disneyland trip from May! We got to go for 5 days - they had an amazing promotion going on, so we took advantage of it! We had the best time! Since we were there for so long, we got to go on every ride we wanted to, and we had the layout of the park memorized by the time we left. 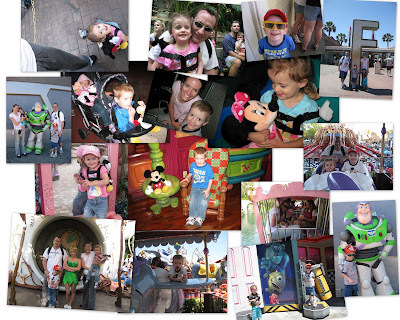 The kids loved the Buzz Lightyear ride, Mr. Toad's wild ride, and Dumbo the best I think. Ryan and I went on the Tower of Terror (separately, of course) - weren't we brave? Too bad there's no pictures of our faces on that one! HaHa! This time Cole wasn't as shy of the characters - Katelyn was. She likes to look at the pictures of her with them but was literally hanging onto me with a death grip! 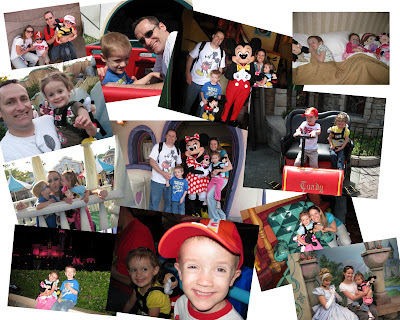 I tried doing a photo collage in Picasa for the first time - hope it turned out alright! Here are some more pictures of all the fun we had - of course we had to take a picture in front of the "F" of California Adventure. I'm so glad we got to go! We had an amazing time and hopefully built a lot of good memories for Cole & Katelyn! I'll be back in a little bit to post some pics of Cole's preschool graduation and 5th B-day party (I know, crazy that he's 5 already, right?). So many cute pics! I love the one of Cole climbing out onto Dumbo's ear and KK at the princess mirror. It looks like you guys had such a great time. Next time we'll have to see that Cole's jar and Aiden's jar get full enough for Disneyland at the same time! It was fun to read all your updates. I love the photo collages - I'll have to try those sometime. Cole's birthday is the day before my Abby's. She turned 7 this year. Your family is so cute!